I’ve been a big fan of Travis for a while now. It runs the builds for most of my open source projects. However, recently I’ve been finding it a bit sluggish, and something fishy seems to have happened to my automated NPM deployments. So, I figured it was time to give some other CI services a go. One I’m trying at the moment is Snap CI. This is how I’ve done it, YMMV. The basic idea is to have one stage in your pipeline per environment. 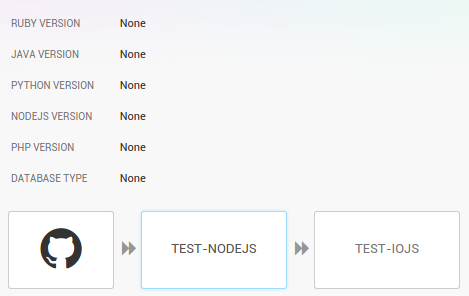 For example, below I have one stage for node v0.12, and one for io.js v2.3.2. It’s important to note that NODEJS VERSION is None. This version applies to all stages in the pipeline, and we don’t want that. We can do this for each stage, but at some point we might want to put this into a script and version control it along with our code. Too much code in CI tools can be considered a smell, and we probably want to avoid this. you’ll get an error: ./scripts/install: line 4: nvm: command not found. Thanks to Akshay Karle from ThoughtWorks for helping me out with this. Shell scripting is not my forte! I don’t know about you, but I quite like the Jest convention of putting tests in __tests__ directories. It keeps the tests local to the modules they’re testing, and visible in the src directory, rather than hidden away in test. I know, it’s the little things. "mocha": "find ./src -wholename \"./*__tests__/*\" | xargs mocha -R spec"
"mocha": "mocha 'src/**/__tests__/*' -R spec"